Repairers can learn from a lineup of automotive joining, diagnostics, aluminum and steel experts at the Society of Collision Repair Specialists’ SEMA OEM Summit in November, the organization announced Tuesday. The OEM Collision Repair Technology Summit on Thursday, Nov. 5, at the SEMA Show will focus on new vehicle construction and tech trends as cars, trucks and SUVs become stronger and smarter, both internally and in perceiving and reacting to threats on the road. Space is limited at the OEM sessions, so repairers might not want to wait until the final early registration discount date to sign up for those Nov. 5 classes. Attendees can sign up for a single presentation or buy a pass to all three. Find more about SCRS’ entire Repairer Driven Education package at SEMA here. 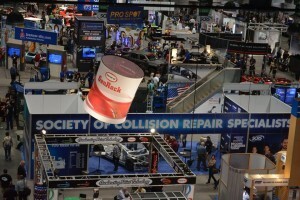 “The program is designed to put SEMA Show attendees in a room with innovators in automotive structural design and technology, providing one of the most unique networking and learning opportunities available to the collision repair industry,” SCRS wrote in a news release. Panelists will discuss joining as active-gas welding gives way to adhesives, rivets, inert-gas welding and other techniques to connect aluminum and a more diverse mix of steels in modern vehicles. Another panel will examine diagnostics, scans and calibrations and demonstrate the need for full-system scans. 12:30-2:30 p.m.: “The Future of Aluminum in the Automotive Industry”: Learn from a presentation and OEM panel about what automakers are doing and will do with aluminum and what thought has been put into repairability. 3-5 p.m.: “The Continuing Evolution of Advanced Steels in Automotive Bodies”: Learn from a presentation and OEM panel about how steel is aggressively competing to be the auto body safety and lightweighting answer and get perspective about repairing cars with lighter and stronger steels. These should be worth your time. As you’ve probably noticed from our coverage, automakers aren’t sitting around hoping gas prices drop or lobbyists eliminate the 54.5 mpg 2025 benchmark — and the inclusion of the small-overlap crash test by the Insurance Institute for Highway Safety in 2012 seems to given them an added incentive to make auto bodies out of tougher materials.